women of color | preciousandmakeup.org || it's just a beauty thing. Pair a colorful eyeshadow with a neutral eyeshadow : Try wearing a colorful eyeshadow with a neutral eyeshadow like a light beige/tan for a pop of color without your look being overwhelming with color. Colorful eyeliners : These are my favorites when I do neutral looks. I like to use a metallic green liquid eyeliner paired up with my favorite neutrals to kick up the look. I also like to use colorful eyeshadows as eyeliners as well. All you need is a thin liner brush that’s dampened and a colorful eyeshadow you’d like to use as an eyeliner. When using eyeshadows as eyeliner, it gives a much softer look than using regular pencil or liquid liners. Use colorful mascaras : Who says your too old to wear colored mascara? Try using one to spice up your look. Sometimes, I like to use metallic/glitter liquid eyeliners on my lashes for a dash of color. Cheek power : Colorful looks aren’t just for your eyes. Try using a bright blush for a kick of color on your face. Remember NOT to over do it with the blush and keep eyes/lips neutral. Colorful Pout : Try using a colorful lip color like pinks/reds/etc. Just like when it comes to blush, try to keep the rest of your make up neutral to have more of the focus on one thing (like your lips). 1) Apply an eyeshadow base (I used NAO’s concealer/eyeshadow base) on the entire lid, passed the crease, and up to the browbone. 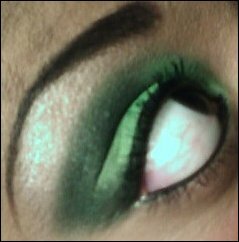 2) Apply a light beige green eyeshadow (I used MAC’s Equibeige eyeshadow) to the inner lid. 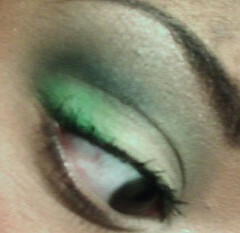 Apply a bright green eyeshadow (I used NAO’s Arrant/Fled eyeshadow duo; I used the green side) on the outer lid. 4) Apply a olive green eyeshadow (I used Milani Antique Gold eyeshadow) to the crease and blend up to the browbone. 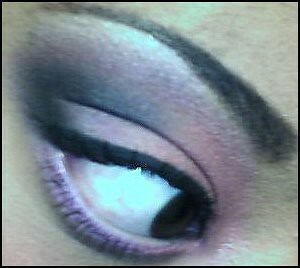 Apply a matte black eyeshadow (I used Artistry Black Tie eyeshadow) on just the outer crease. 5) Use a brown eyeliner as a base and apply it to the lower lashline 1/3 of the way. 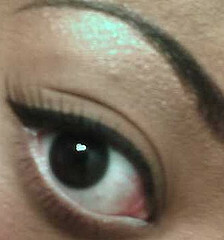 Apply a dark brown eyeshadow (I used Artistry’s Espresso eyeshadow) on top of the eyeliner. Apply an eyeshadow base to the inner lash line and then, apply a light beige eyeshadow on top. Use a light shimmery beige as a highlighter on the browbone. Finish off with a few coats of black mascara on both the top & bottom lashes. 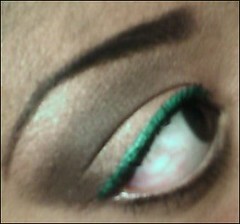 You can also use a white pencil eyeliner on the bottom waterline like I did. That’s completely optional. Lower lashline : Beautique Brown eyeliner as a base, Artistry Espresso eyeshadow on outer lashline, and Artistry Spun Silk eyeshadow on the inner lashline . You are currently browsing the archives for the women of color category.